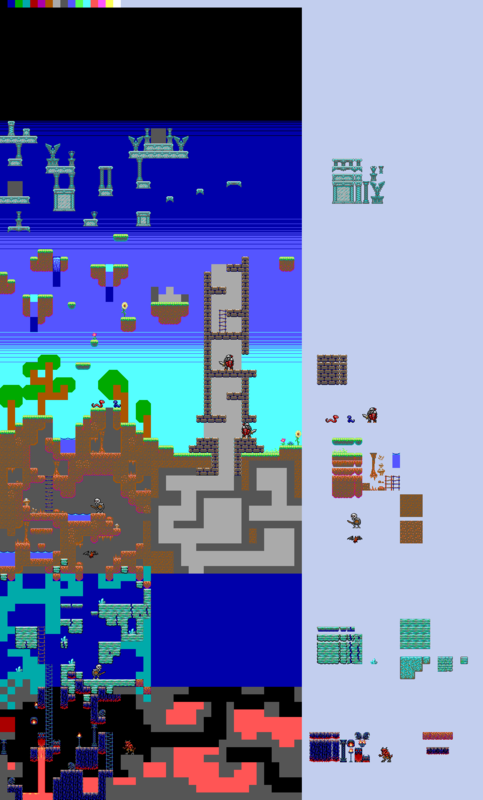 Picked up an old unfinished mockup for an EGA palette adventure platformer in the vein of the Monster World games. I'm unsure about the magenta used to define the underside of the dirt tiles. My desktop's display doesn't like pure magenta, but I kind of like the look of it on my laptop and phone. I wanted to avoid using black as it's a bit too contrasty and likewise the dark blue. These look lovely. I think the black as bg is inescapably better for caves though. These are amazing! The magenta looks really good, no worries there. I'm looking forward to seeing this complete. The dirt looks a little noisy like it's unfinished, but you've got a more processed tile to the side. Is it in the process of being updated to match? The blue on the ladder looks out of place in the underground section, especially if you go with Helm's suggestion and make the background black (I agree with him). It looks really good on the light background though. I'm afraid I have to disagree, I don't think the magenta works. It has almost the same value as the brownish orange, and doesn't read as a shadow to me. Also both are too close to the gray, so the dirt tiles look very flat compared to the other tiles (this might be irrelevant if those tiles are not final, as Sharm noticed). I agree with Helm about black. Quick edit from Helm's with 3 versions. I don't say any of these is good, in fact I don't know how to solve the issue with this hellish palette. But at least I think they offer a better contrast in those tiles. Red+grey combo is definitely the best from the three. I think for EGA, it might be best to avoid noisy tile blocks, just go with flat color plus detail embellishment in a different shade. Unless you dither red+grey and use *that* as a flat color! Tried some new dirt tiles to reduce noise. A couple of varaiations red and grey and adding red to brown and grey, with grey and black backgrounds. Given the questionable nature of the magenta I dropped it and resigned myself to using black edging against the gray. I quite like the bottom grey on red except on the underside where the red just looks too luminous. I think the black as bg is inescapably better for caves though. I was planning to have a distinct background colour for each for each of the strata, getting darker the deeper it gets, but given the limitations of the palette recognise I may not have a choice. The dirt looks a little noisy like it's unfinished, but you've got a more processed tile to the side. Is it in the process of being updated to match? That's an earlier version. The more I work on something the noisier it gets. Quick edit from Helm's with 3 versions. I don't say any of these is good, in fact I don't know how to solve the issue with this hellish palette. The red and grey does look promising. Love the combination of the blue and brown, I'll have to find somewhere to use it. Added a couple more variations. I thought the dark purple worked as a secondary light (never thought to consider it was supposed to be a shadow). Then again I'm looking at this thread on my laptop which screws up colors. Mid blue + brown needs to be made to work. Probably best for a new set of tiles with their own design. Reworked dirt tiles. 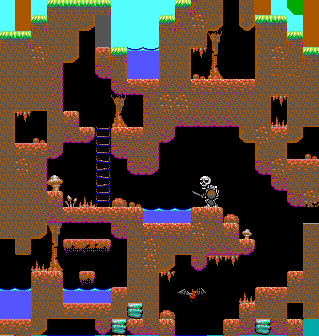 Redid hell tiles cleaner. Misc. That is incredibly awesome now. 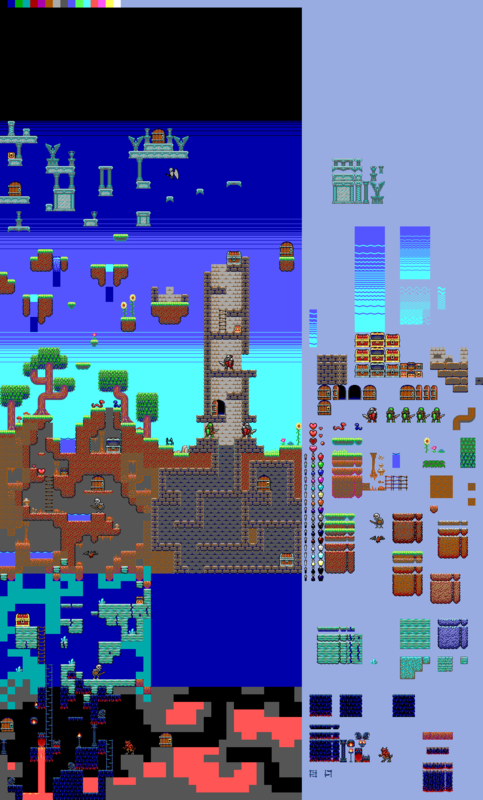 EGA is one of those palettes that demands pixel placement over color choice and your fixes show that. This is coming along beautifully. No real criticisms, just encouragement. Keep it up.